It was just before sunrise when I opened my eyes. A soft palette of pastels reflected off the polished steel perimeter of my cabin window, signaling the sun’s imminent break of the horizon. My cabin mate Mareike, a biologist specializing in coral disease, and I raced up the spiral staircase to the bridge. Pressing our left sides on the railing, careful not to lose our footing on the rocking boat, I was surprised how quickly we moved, our balance having adjusted to the rough seas — even if the bruises on our hips and thighs begged to differ. Most of our research team was up with the sun, 10 people in total including seven Cook Islanders, one Australian, one German, and one American — me. By the time we reached our anchorage off Mitiaro, a raised coral island within a labyrinth of freshwater caves, home to fewer than 200 residents and located in the Cook Island archipelago, we had become a fairly cohesive unit who refused to take a moment of this three-week-long expedition for granted. 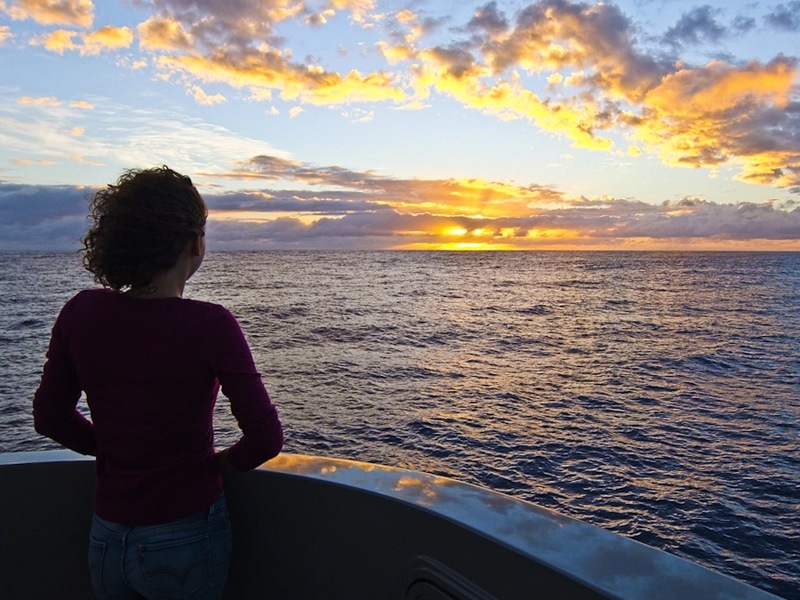 THe California-based Waitt Institute generously had donated the state-of-the-art research vessel we were aboard. 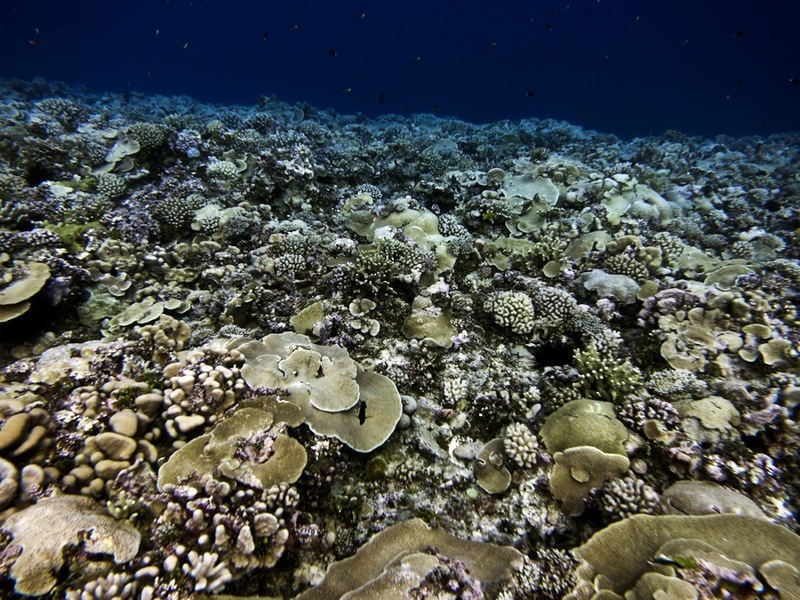 They facilitated the multiple-island baseline reef assessment to support the Cook Islands Marine Park Project (recently declared by Prime Minister Henry Puna; once legislated, the 386,000-square-mile park will be the largest in the world). Mitiaro was the third stop of five islands on this trip, and while it may have lacked the gentle turquoise lagoons of the first two, it gained dividends with its rugged beauty and subterranean mystery. “I’m getting tired of seeing so many whales,” joked our chief scientist Dr. Teina Rongo after we surfaced from our first dive. 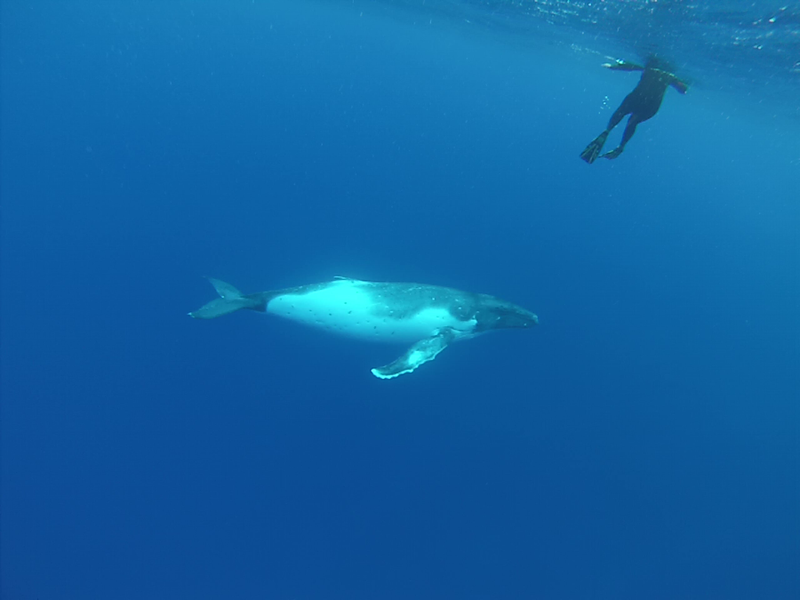 It was winter in the South Pacific and that meant humpback whales were migrating through. It seemed every time we looked at the sea, a spout, fin, or fluke would appear, but never too often to go unnoticed. And when a whale song was heard underwater, we’d each look up from our clipboards to turn and face the dropoff, hoping for the majestic creatures to pass by. While a few intrepid travelers trickle into Mitiaro each year for a taste of Polynesian hospitality via the Itiki homestay experience, the island is not accustomed to a gaggle of 20-plus heads showing up in the harbor. On a borrowed flatbed truck from the island’s mayor, we piled in and drove off, bouncing down the crushed coral roads, with our girls screaming as piglets scurried out of the path. 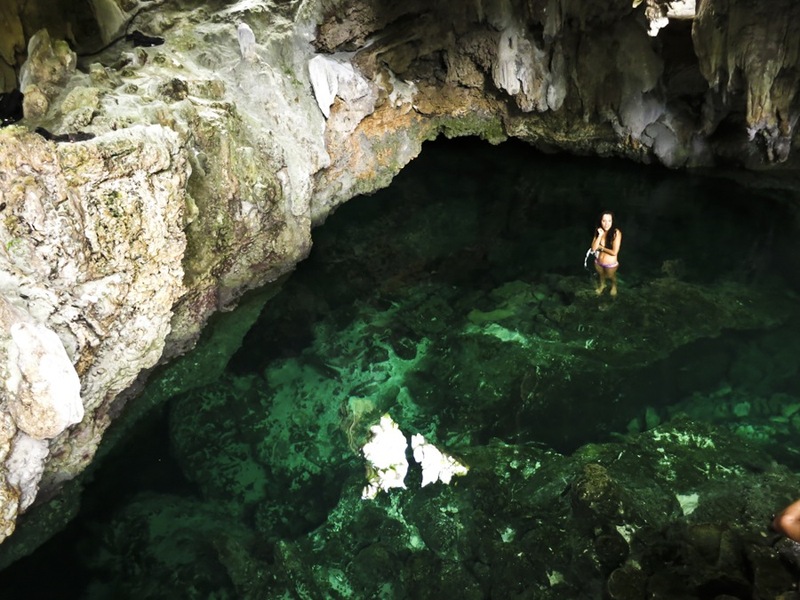 We turned into the bush and found Vai Nauri — an easily accessible freshwater cavern. 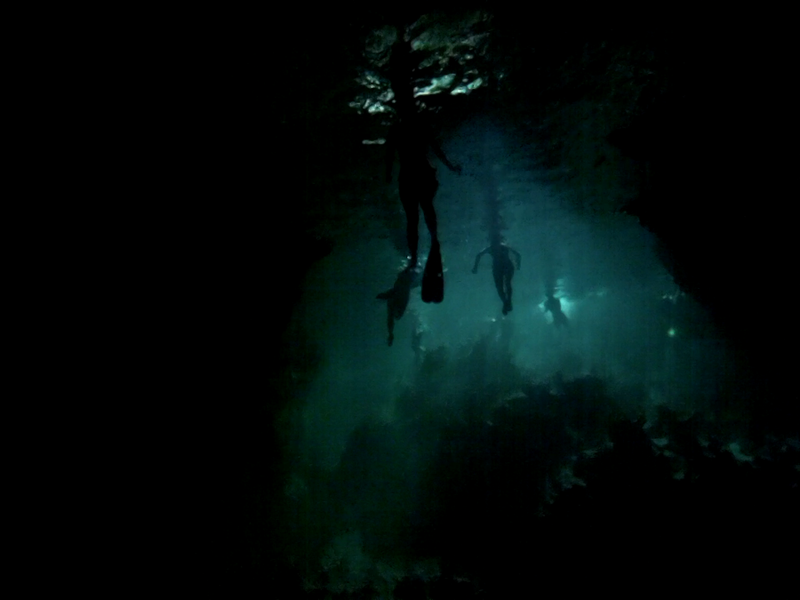 Into the chilly emerald water we leapt, a few of the boys freediving down a long, dark stalactite forest tunnel, surfacing minutes later in an air pocket beneath the island. 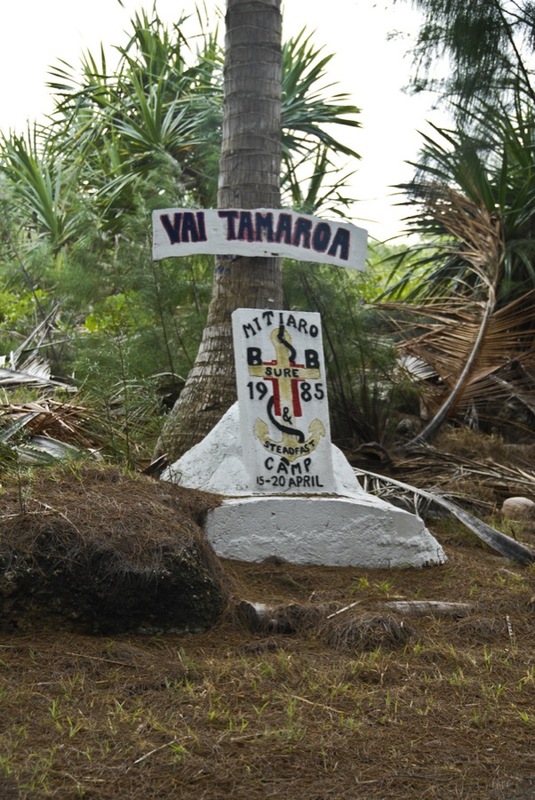 Further toward the center of the island, a sign reading “Vai Tamaroa” marked the start of a long path. 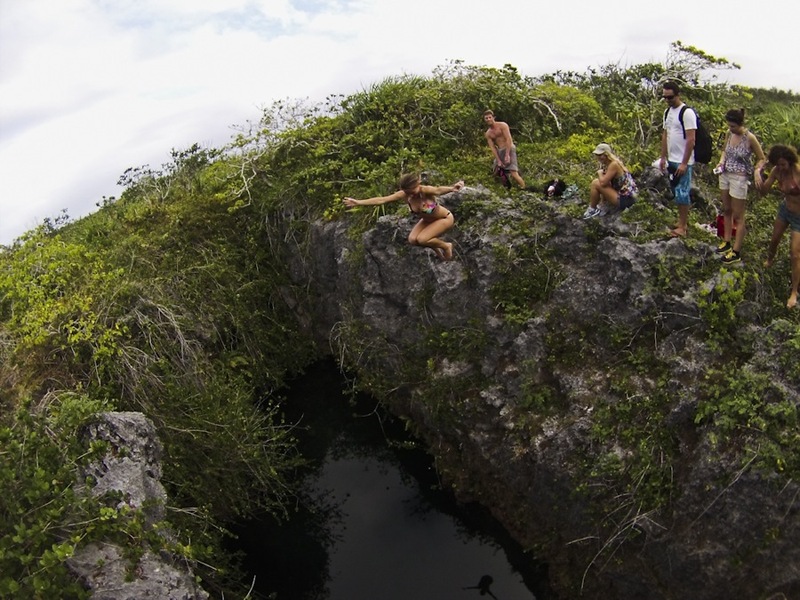 For 20 minutes we walked, over spines of coral fossil and weed, to an isolated freshwater swimming hole surrounded by cliffs. Having been to this spot before, I jumped first, excited to share it with the others. “It’s really deep and an easy climb back up,” I promised, the visible stalagmite beneath the surface playing tricks on our depth perception. Fading light and impending rain forced us back to the harbor. Many of the islanders gathered to say their goodbyes as we readied the skiff for our departure back to the anchored boat. The harbor had recently been redesigned, and with the new boat ramp came a thick cover of bright green algae, which was accented by the setting sun. It seemed every one of the island’s children were sliding down the ramp barefooted, twirling and laughing. One by one, we joined in the game. Holding hands with them, giggling and trying not to sustain too many injuries, we were engaged in acrobatics until the sun was well beneath the horizon. Driving away that night, I said a quiet thank you to the island, believing that the landscape and people I loved so fiercely in the Cook Islands had taken a few more unsuspecting hearts, and just like me they would be back. Mareike, happy about her decision to get out of bed and watch the sunrise. 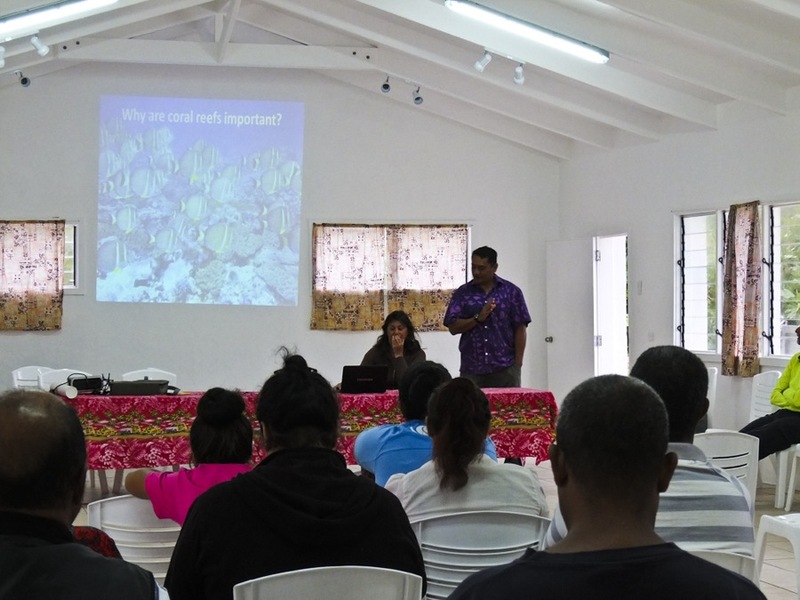 Dr. Teina Rongo, chief scientist and coral expert, with Jacqui Evans, Cook Islands Marine Park Manager, explaining our research at the Mitiaro community meeting. 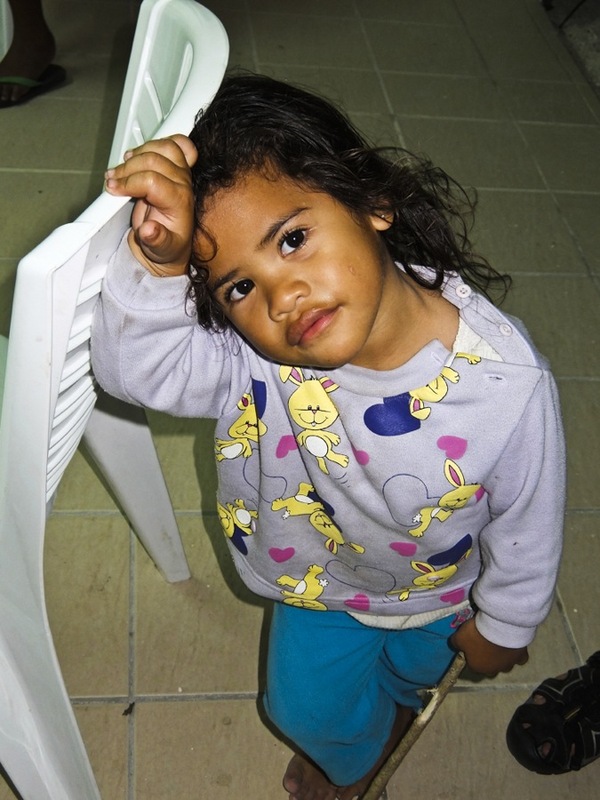 Teina is a Cook Islander and was able to explain our work in Cook Islands Maori, the local language. 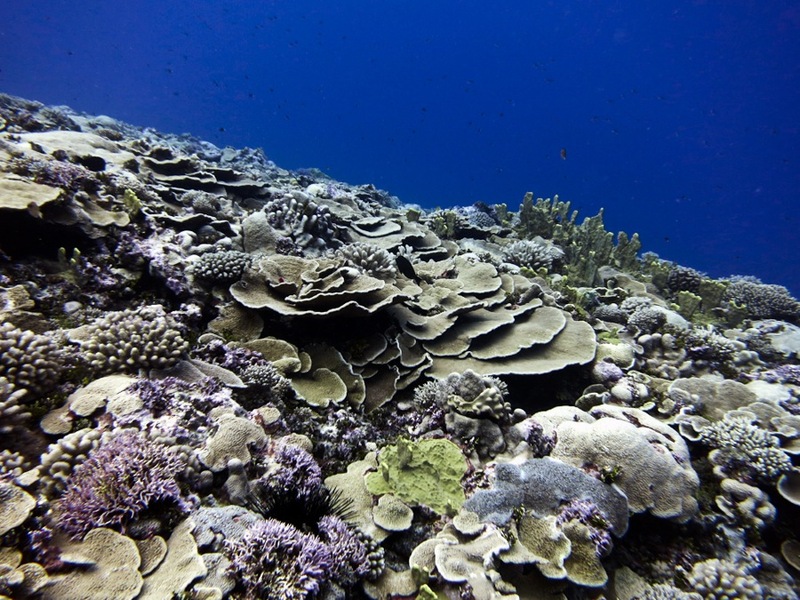 A healthy hard coral garden. 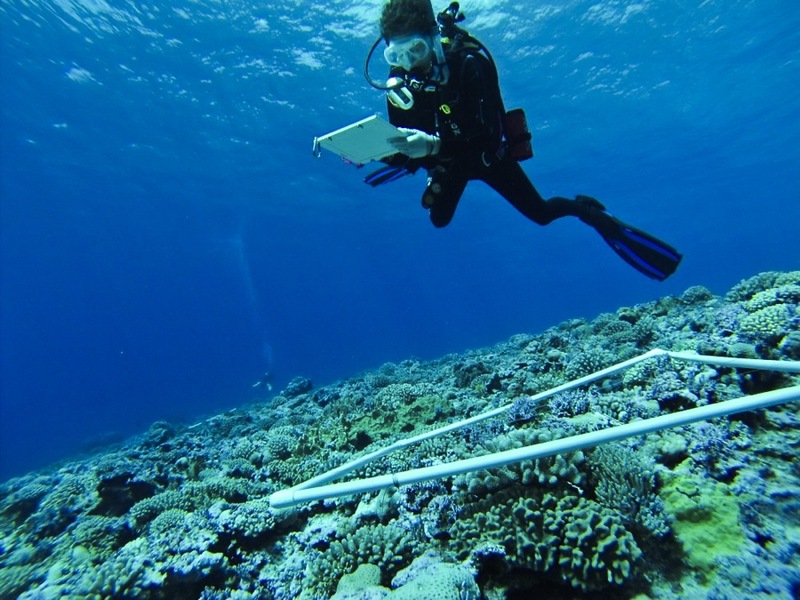 Dr. Mareike Sudek, coral biologist, performing a coral survey. Our surveys were conducted at depths of between 7 and 10 meters, meaning we were at the mercy of relentless surge. 100% coral cover heading out to the dropoff. 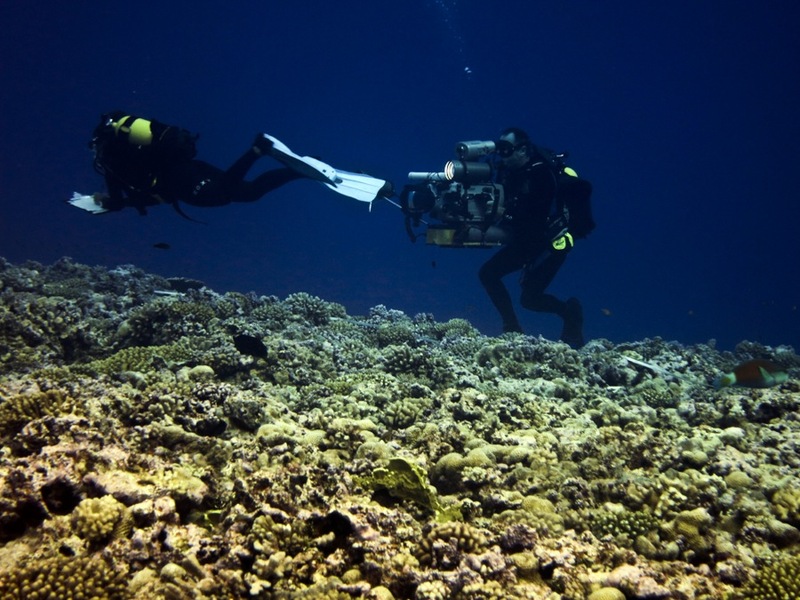 Here I am performing a reef fish survey along the transect, while being filmed by David Hannan, an award-winning Australian underwater filmmaker. 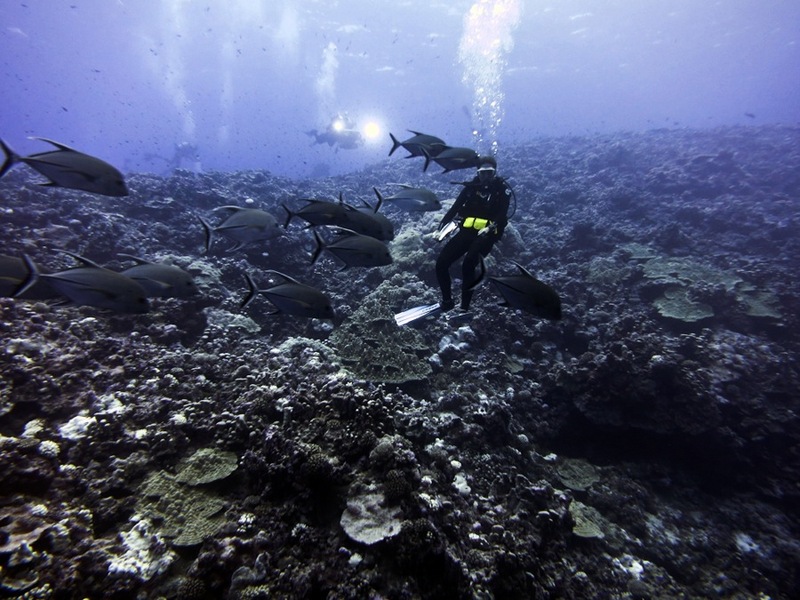 It looks like I’m standing on coral, but I’m actually hovering in a crack between two walls, mesmerized by the black trevally that kept circling me. A baby humpback whale swimming near us...not sure who was more curious. Here's Barbara Hanchard, Cook Islands researcher and photographer, about to get a thrill when she looks down! Because of the waves and surge, the dive boats would wait outside the breaks, causing us to have to do our safety stops in the blue. Mareike and I hanging out at 5m, waiting to see what comes up from the deep. 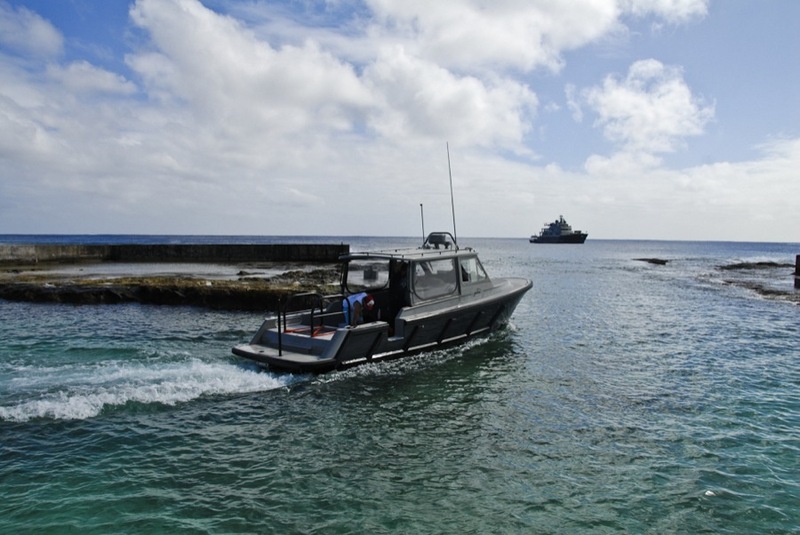 The Waitt Institute tender drops our group on shore at the newly designed Mitiaro harbor, with the research vessel in the distance. Our flatbed tour bus for the afternoon. The Cook Islands crew was excited to show the boat crew around. You can see the Mitiaro church up ahead, and then within a quarter mile we were away from all other cars, houses, and people. 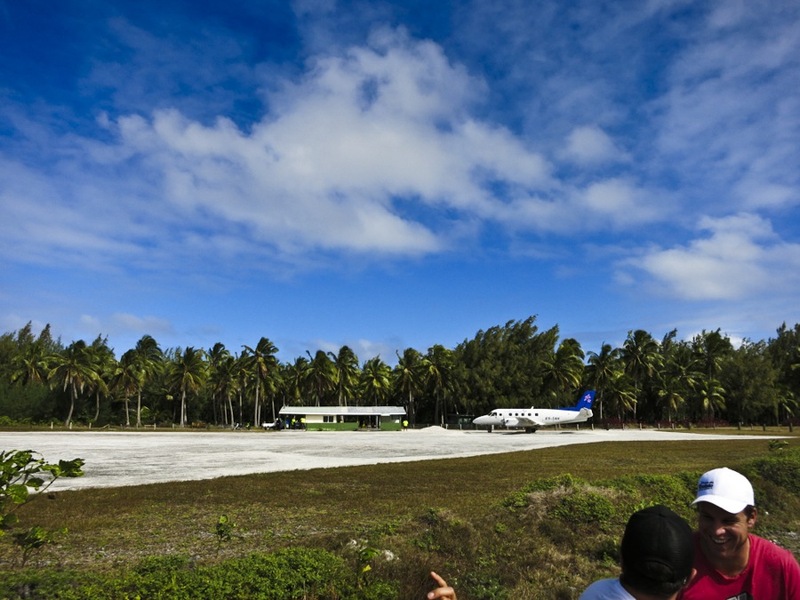 Driving alongside the runway (also crushed coral), we were lucky enough to see an Air Rarotonga plane take off. Inside Vai Nauri cave, crystal clear fresh water played tricks on all of us. 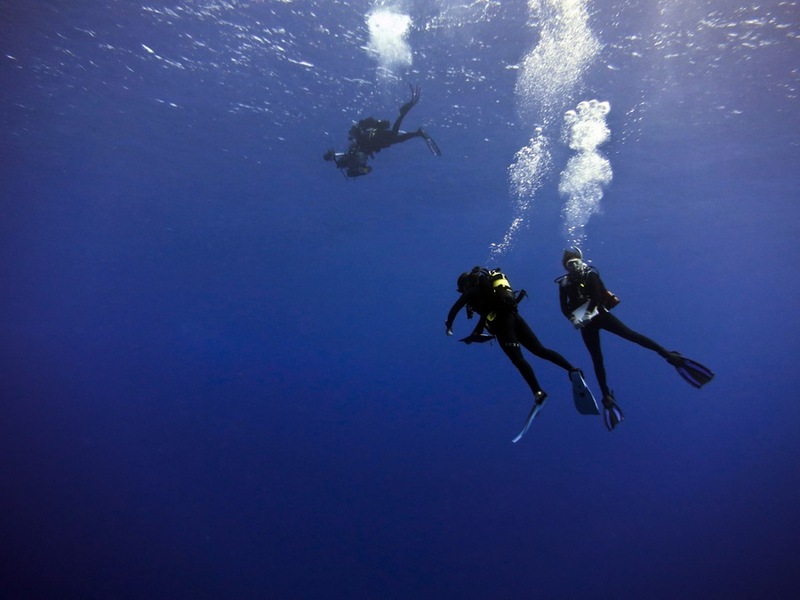 We were used to freediving in salt water…you sink quite quickly without the salt! A few of the deckhands freedived quite a long, dark tunnel to another air pocket. This was their view on the way out. Many of us were anxiously awaiting their return. Vai Tamaroa, trailhead to the best swimming hole on the island. Having been to Mitiaro in late 2012 for shark sanctuary consultations, I had jumped from this spot once before. The others were happy to let me leap first to show that it was safe. 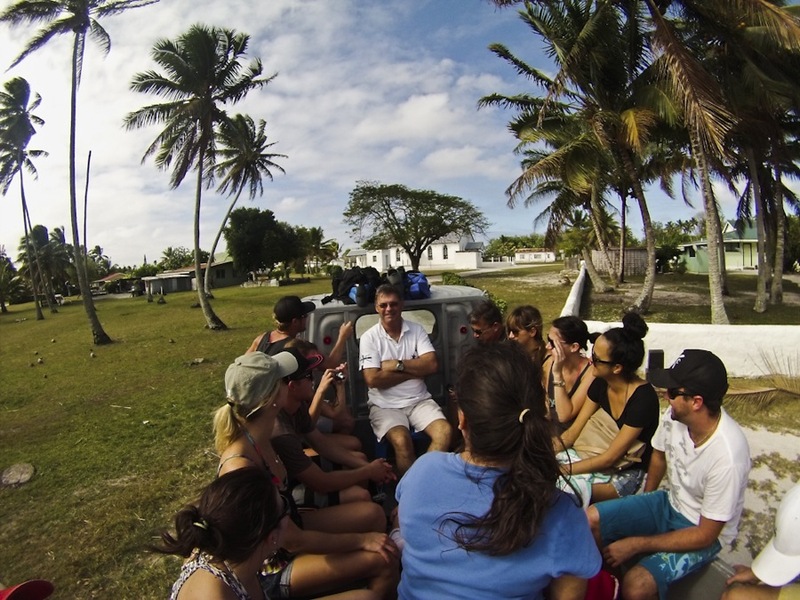 On an island as small as Mitiaro, any exploration involves ample opportunities to just sit and speak with locals. 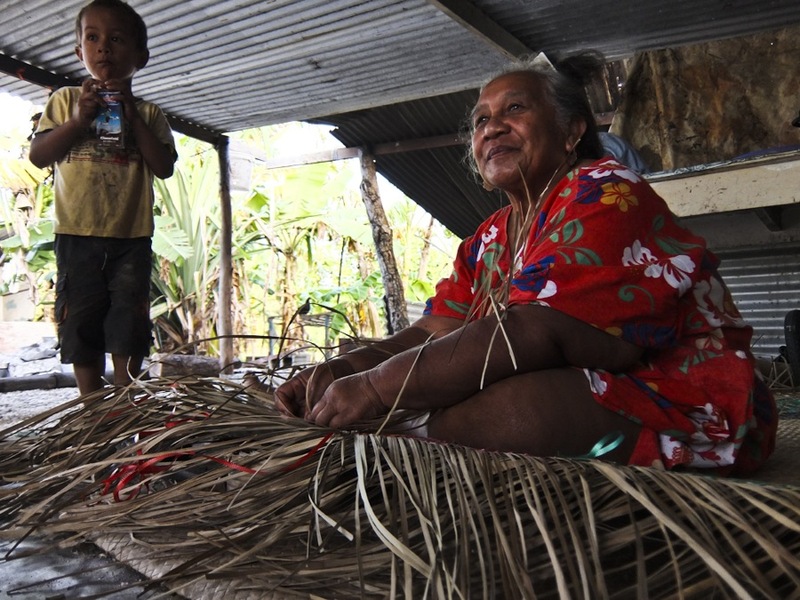 This woman was weaving a mat made from pandanus and inserting beautifully colored ribbons through the edges. She would send it to Rarotonga to be sold during the Saturday markets. This is 4-year-old Mitiaro sweetheart Mikaela. The girls were definitely showing me up. 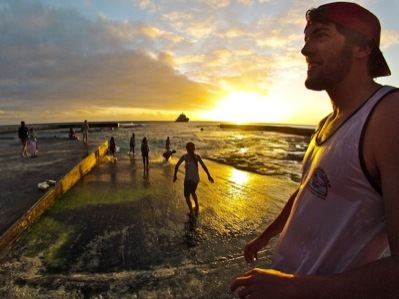 Algae sliding may be my new favorite sport.